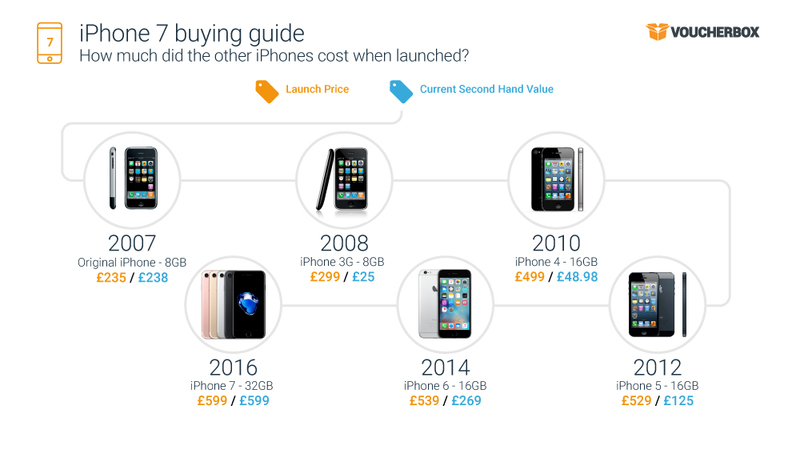 With the UK sale date of the iPhone 7 taking place on the 16th September, money saving expert Voucherbox.co.uk has conducted the necessary research to ensure Apple enthusiasts get the most out of this hot new handset. From half price online deals to checking out the latest features and how they can benefit you, Voucherbox has it covered. The iPhone 7 will be available on the Apple website for purchase outright. It will also be available with major providers such as Vodafone, EE, Three and O2. Voucherbox’s research into the best deals with the top network providers in the UK reveals that it is much cheaper to buy the phone outright. 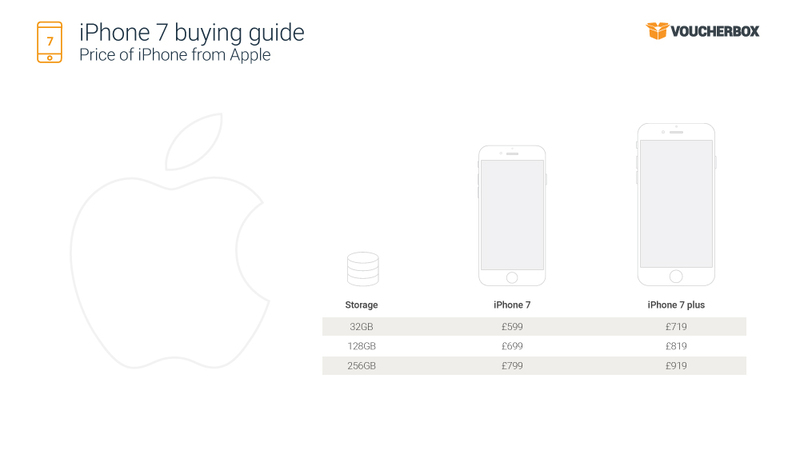 An iPhone 7 with 32GB storage costs £599 directly from Apple, whereas a 24-month contract with EE will see customers paying £1,202 altogether – more than twice the value of the handset. The best value provider is Three, with a 24-month contract costing £37 per month and £1,037 in total. 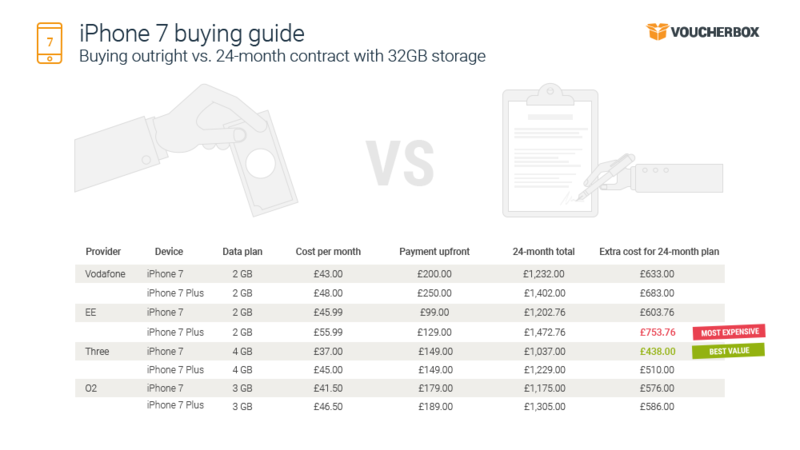 Alternatives could also include buying a sim only package, with 02 these start at £5 a month and then your £599 handset is fueled for just £120 for 24 months. As ever, there was plenty of speculation prior to the launch as to what we could expect from the new iPhone and many of those predictions were spot on. 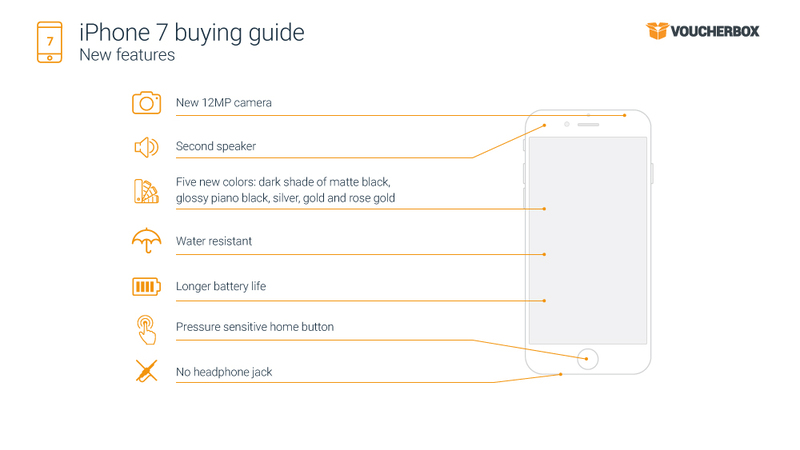 A new pressure-sensitive home button meaning fewer technical glitches and greater ease-of-use. Water-resistance has been upgraded to the international protection standard IP67; something many accident-prone users have been waiting for. Two new colors have been introduced: simply, Black and Jet Black. The new camera on the iPhone 7 Plus is touted as being nothing short of revolutionary, with its dual telephoto and wide-angle lenses. Most notably the 3.5-mm headphone jack is no more, with music-lovers needing to invest in wireless headphones. With this move Apple are paving the way for the next generation of mobile audio. One of the main changes with the iPhone 7 is the AirPod wireless headphones which come with 24-hour battery life and can sense when they are put in the ear and when they are taken out. AirPods will be available in late October for £159. Although Apple has done away with what they call “ancient” technology in the 3.5-mm audio jack, that does not mean owners of the new phone will be left out in the cold without a pair of Lightning-connected headphones. Every new iPhone 7 will come with the following: EarPods with Lightning Connector, Lightning to USB Cable, 5W USB Power Adapter and a Lightning to 3.5 mm Headphone Jack Adapter. 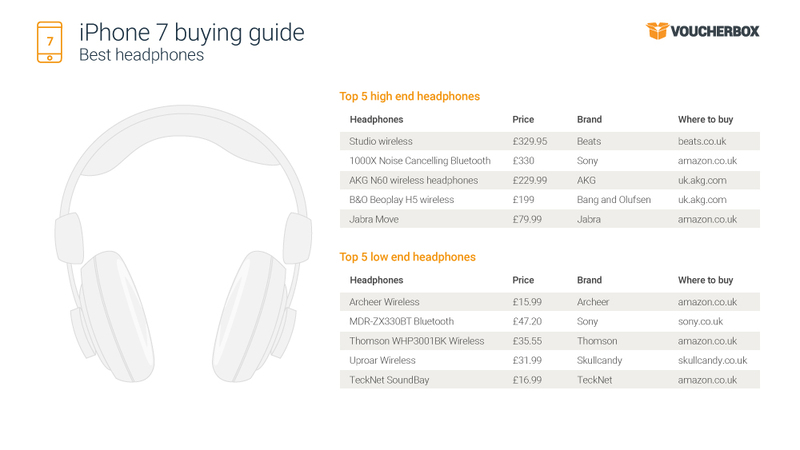 Voucherbox have also created a comprehensive guide to the best wireless headphones on the market, whatever the budget. For those looking to save money on your iPhone 7, Voucherbox.co.uk has some fantastic Vodafone vouchers including a £85 Amazon gift card with the purchase of a 24 month plan at Vodafone, valid until September 25th.